Final tests are being run for the onboard oxygen generation system that will be installed on all Russian operating fighter jets, including those to be supplied abroad. 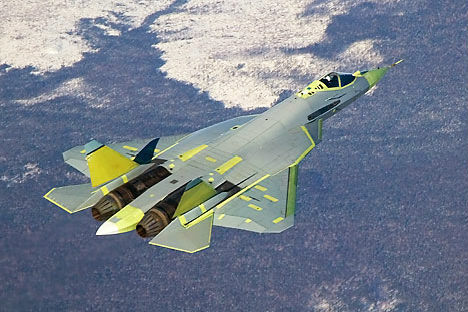 The Russian Sukhoi T-50 fifth generation fighter jet is equipped with cutting-edge computerized life support systems, including an oxygen station securing unlimited breathing gas supply and advanced pilot’s compensation system that anticipates gravity overload. The research and development enterprise Zvezda has announced the final tests for its onboard oxygen generation system that will be installed on all Russian operating fighter jets, including those to be supplied abroad, Izvestia daily reports. Unlike the 90 kilogram oxygen bottles system the new generator weights a mere 30 kilograms, a crucial weight and space economy in modern combat aircraft construction. “Oxygen is produced from the atmosphere as the system takes it from the engine’s compressors and redirects it to pilot’s mask. Flight time no longer depends on oxygen supply," Zvezda’s Chief Specialist Mikhail Dudnik told Izvestia. It took five years to shape up the system, Dudnik said, but all four Sukhoi T-50 PAK-FA 5G fighter jets currently undergoing flight tests near Moscow were already manufactured with this system at a Sukhoi plant in Komsomolsk-na-Amure. The 5G fighters made their way across the country without oxygen tanks onboard. Soviet and Russian military aviation previously employed oxygen bottles - an old, but time-tested technology. But it also imposed certain restrictions on mission duration, because while refueling was an option for many long-range military jets, oxygen re-supply was not. So a pilot had to always keep a close eye not only on fuel, but also the oxygen capacity of his aircraft, as elevations 4 kilometres or higher require a breathable gas supply to avoid oxygen deficiency. An unexpected leakage of excess oxygen spending could lead the failure or termination of a vital mission. Consequently, every Russian Air Force airfield is now equipped with oxygen producing stations, which must be manned by experienced personnel. Soon such stations will become a thing of the past. The advanced flying characteristics and super-manoeuvrability of Sukhoi T-50 fighter jet exposes pilots to extreme G-forces, actually reaching the human ceiling limit. A T-50 pilot cannot actually use the jet to its fullest potential without ultramodern technical assistance on a variety of fronts. That is why Sukhoi T-50 fighter jet pilot requires a brand-new antigravity G-suit capable of compensating up to 9G for an unprecedented 30 seconds the plane is thrust into a bone-crashing missile evasion manoeuvre. The unique G-suit, developed by the same Zvezda enterprise, allows the pilot to eject from the plane at the height of up to 23 kilometres. The onboard computer anticipates overload and avoids the delay of the system response to pressure compensation. The gravity compensation system calculates everything, from the air pressure created in the rete of flexible pipes entwisting the G-suit and supporting the pilot’s body to the 6-7 atmosphere air pumped into pilot’s lungs to compensate the external chest pressure and prevent him from blacking out. “This system is our own know-how, no one in the world has managed to develop such a system so far,” Zvezda’s Chief Specialist Dudnik told Izvestia in early July. A safe flight is a comfort flight and for military pilots, who are by no means comic book heroes empowered with the ability to fly, must answer nature’s call, particularly during long patrol missions. If there is a pilot that can operate a supersonic fighter at a 20 kilometre altitude for 12 hours straight, performing manoeuvres and refuels, than he is a true superhero and should be cloned. Zvezda’s deputy chief designer Nikolay Dergunov informed Izvestia that specially designed underwear is being tested to become an integral part of PAK-FA pilot’s gear. Some previous generation Soviet fighter jets were first equipped with ‘personal convenience’ systems in the 1990s after pilots flat out refused to use diapers, arguing it was uncomfortable to operate a jet while wearing them. But only on the PAK-FA it is fully integrated into the pilot’s suit and does not divert his attention from the mission. The PAK-FA pilot is going to be surrounded by gold at all times as NPP Technologia enterprise in Russia’s Obninsk has developed a gold coating for the cockpit which reduces radar’s ability to detect the equipment by 250 times. The coating also protects pilot from high-energy radar pulses and solar radiation. The coating consists not only of gold, but a combination of various metals, including stanum and indium, applied on the cockpit with a specially developed magnetron installation. The NPP Technologia enterprise, which also produces the majority of composite elements for the Pak-FA hull, says all systems will are go to supply all future 5G jets with golden cockpits once industrial production of the aircraft starts in 2015. After the collapse of the 1990s, Russia was lagging behind in the development of digital ‘military and space’ grade electronics. Therefore, developing a 5G fighter jet seemed to be impossible without the complete modernization of electronic production in Russia, both military and civilian, which has indisputably been achieved as evidenced by the performance of the four PAK-FA jets during the test flights. The Sukhoi T-50 fighter jet onboard information computation has been shifted from the classic multicomputer system to the Integrated Modular Avionic system, a long-anticipated change when a single processor controls many processes aboard, attributing priority level to each process and computing the most critical first, which prevents PAK-FA’s computer from freezing. It has been an absolute precondition that the Russian 5G fighter jet will be using only domestically-produced electronic components and to achieve this objective, the Russian electronics industry was forced to undergo a revolution which ultimately proved successful.